Pav bhaji or pao- bhajee is a popular Indian street food which originated from Mumbai but is now eaten all over India and also outside India. Pav means bread and bhaji is a term used for vegetable and curry dish. The pav bhaji masala used in this recipe is a special blend of spices. You can get it from any Indian grocery store. 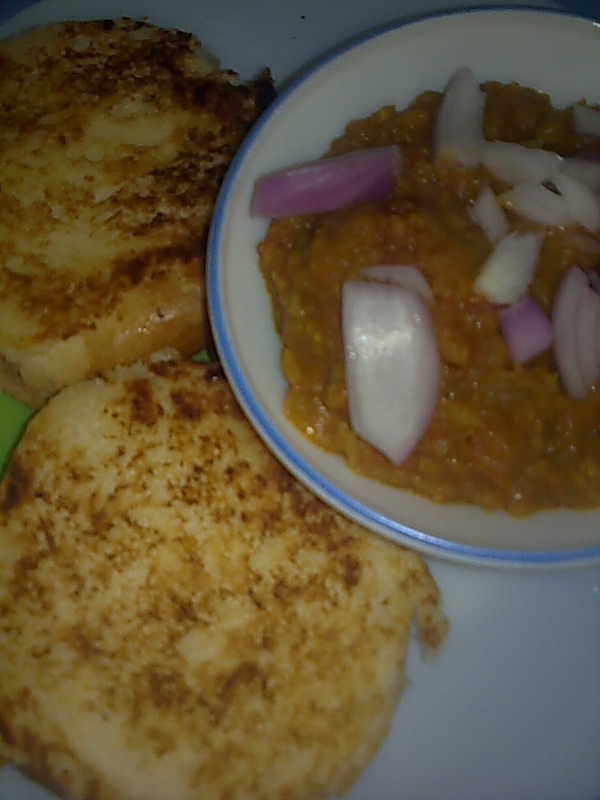 In the recipe below, I have added a variety of vegetables to the bhaji. If you want to add less variety, then you can just add potatoes, cauliflower, capsicum and green peas apart from onion, tomatoes of course. Put roughly chopped vegetable pieces in a food processor to get very small pieces. Place vegetables in a pressure cooker with ½ cup water and salt. Let 2-3 whistles come, then simmer on low heat for 10 minutes. Open the cooker when pressure drops and mash the boiled veggies with the potato masher. Heat oil and butter in a non- stick pan and add minced onion and green chillies. Sauté till light golden. Add ginger- garlic paste and sauté for 1 minute. Add Pav bhaji masala and cook on medium heat for 1 minute. Add tomato puree and tomato sauce. Cook on medium heat for few minutes stirring constantly. Now add mashed vegetables and cook on medium heat for 3-4 minutes stirring occasionally. Turn off heat and squeeze 1 lemon in the bhaji and mix. Garnish bhaji with chopped onion and coriander leaves. Slice each pav bun horizontally into 2 and toast in butter and a little pav bhaji masala. Toast on both sides on a griddle (tava) till crisp and golden. Serve pav with bhaji and lemon wedges. Serve hot.